The inside of the Dalton Adding Machine looks slightly better than the outside. Only slightly. On the plus side and impressively - it still fully functions. No stuck keys or stubborn carry, the printing unit still works fine even. 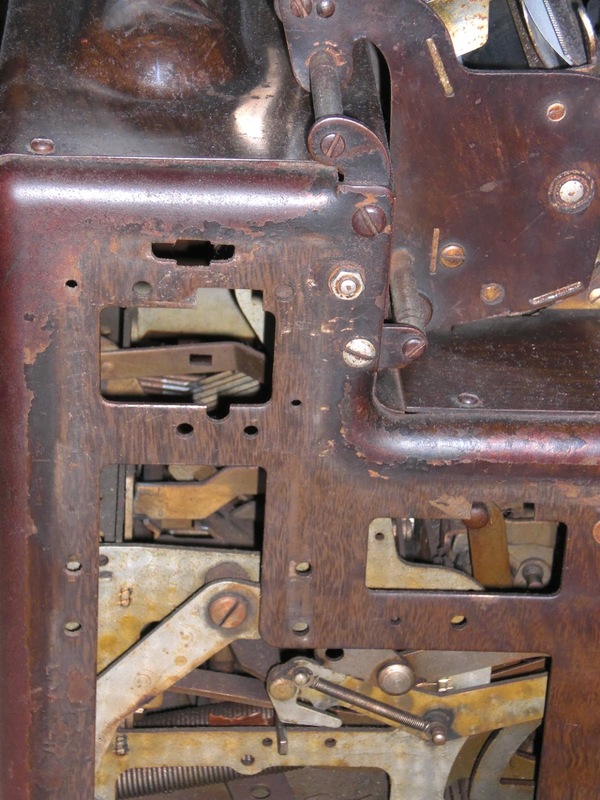 Doubly impressive because it is a very complex mechanism and an early piece of digital information technology. It has a worrying amount of springs to keep it all working. Compared to this machine, a typewriter is simplicity itself. A top and rearview of the machine from this same US patent publication 517,383 are equally dazzling. Not that is obvious at first glance at the drawings, but it is a rocking-segment adding machine with a mechanism to enable 10-key entry. This '10-key' keyboard means the machine does not have 10 keys for every digit position, but actually does move the entered number up when adding a digit. 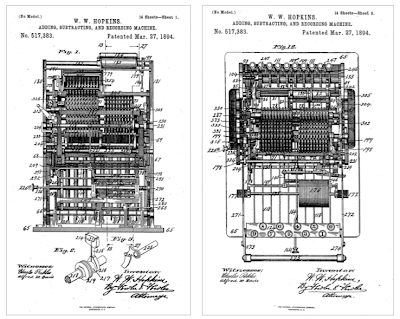 At every adding (pull of the lever), the number entered in the buffer is added to the accumulator register. All done by the rocking segment gears with proper carry and correct. The 10-key entry also means it has a backspace key. A backspace key that actually does erase! Pressing backspace deletes the last digit from memory (the buffer) and moves all previously entered digits one position to the right again. Several more patents were sought and published for the Dalton machine. 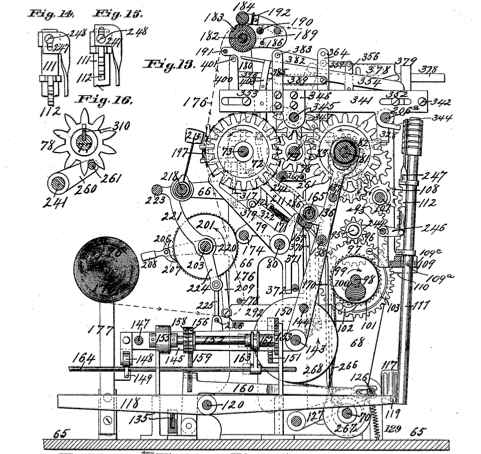 Some pictures from another, later publication show the outline of the machine filled with the mechanics. I'd love to see a photo of this machine. It reminds me of one I used during my college days. That was well back in the slide rule era. My dad was a tax accountant at that time and had a mechanical calculating machine kind of like this that I used for homework. To watch it divide was a wondrous experience! It's not rocket science, but something far more complicated by the look of it! Pics? I think a video might be in order. I have been semi-tempted by later Olivetti adders but always corrected myself before placing a bid. My line in the sand uncrossed.